A small, light-weight journal for your notes, sketches and thoughts when you're on-the-go. Livescribe Journals are a leather-bound journal in black - sold as a pack of two journals. 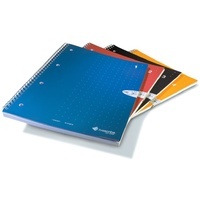 The journals include a scientific, financial and statistical calculator and Livescribe Dot Paper, unlined. A smartpen can carry up to 4 Journals (No. 1 through 4) at the same time. Sequentially numbered Journals are required as the smartpen recognises the journal number and distinguishes between each journal and its unique data. Work through a whole series (1-4) and archive it from the smartpen before starting again with a new series of journals. Archiving saves your data forever! Livescribe journals are compatible with all Livescribe smartpens. Before using any new paper product check that your smartpen is using the latest available firmware. Get more done in less time all with just a few quick taps of your finger.